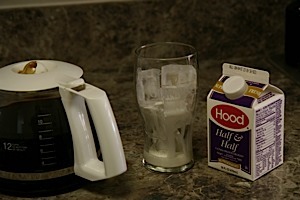 I see a lot of people and restaurants do this incorrectly, so I'm revealing my great secret iced-coffee recipe. 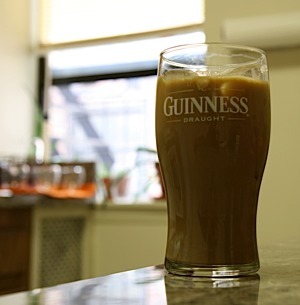 Pouring hot coffee over ice: This just yields weak, watered-down coffee that isn't very cold. Adding sugar after it's cold: Sugar won't dissolve in cold water, so you get occasional sips full of crunchy sugar granules and otherwise unsweetened coffee. 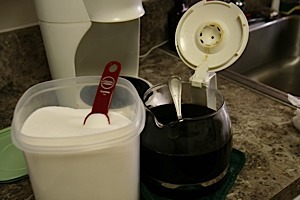 Adding flavor syrups without stirring: I'm looking at you, Dunkin' Donuts. The first sip is sickeningly sweet because it's all syrup, then all subsequent sips are bland. 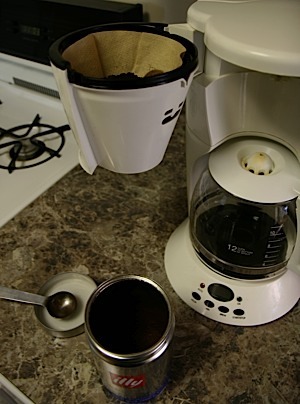 Ice will significantly dilute the final cup, so you need to start with strong coffee to get a good flavor. While I usually use a 2:3 ratio of scoops to "cups" for hot coffee, iced coffee needs a 1:1 ratio. If in doubt, use more. While it's still hot, stir in your desired sugar amount. Sweeten slightly more than usual. I don't put any sugar in hot coffee, but I've found that iced coffee is great with slightly less than 1 teaspoon per coffee "cup". Don't add ice! Just put it in the fridge. Serve over a lot of ice. I suggest a bit of cream. Stir very well. 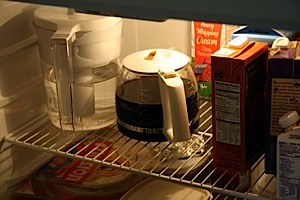 Let it sit for a minute to allow the ice to chill the coffee further and melt slightly. Then give it a final stir, and enjoy. Instead of using a uniform amount of sugar for the entire pot, you can selectively sweeten and flavor each cup with flavor syrups. Unlike sugar, they mix perfectly in cold liquids. Many coffee shops and grocery stores sell Torani syrups, but they aren't nearly as good as DaVinci Gourmet syrups. I strongly recommend DaVinci's Natural Irish Cream and Natural Vanilla ($8 each plus shipping). Now you can stop paying Starbucks and Dunkin' Donuts for inferior iced coffee!